We love a good dinosaur book, and our latest review for Ivy Kids is a good dinosaur book. Written by Sean Callery and illustrated by Sam Hubbard, and released on October 6th, the full title is Dinosaurs In 30 Seconds: 30 Fascinating Topics For Dinosaur Detectives Explained In Half A Minute. 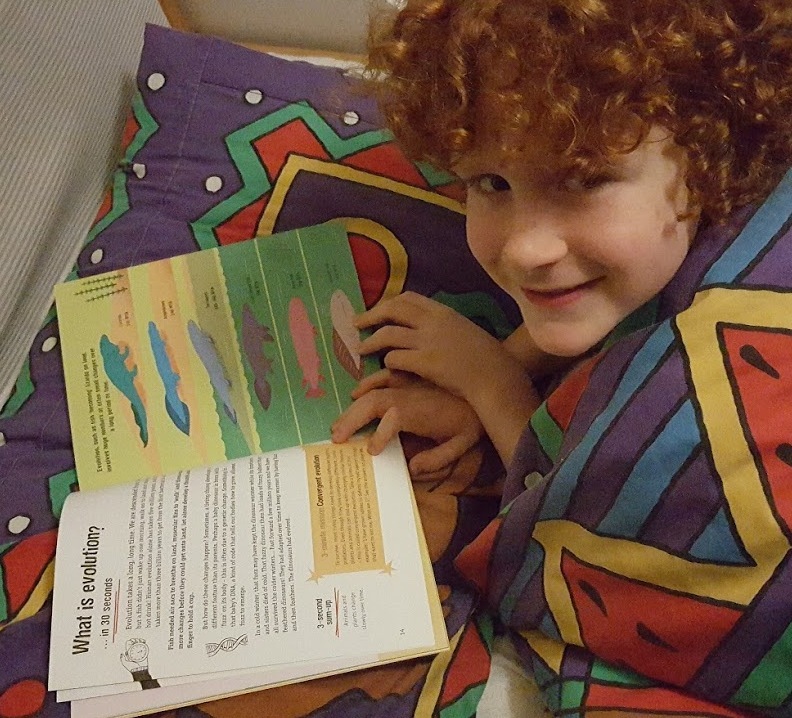 This is a book written in a style which really appeals to young independent readers. All of the text is in small snappy paragraphs which aren't too intimidating, and the whole book is broken into five segments each with it's own glossary, so even new words are introduced a few at a time, and nicely explained. The illustrations are varied, with most not really attempting realism, instead using bright colour in a bit of a comic book style, giving character and really standing out against the backgrounds. The illustrations support the text, and include some more familiar objects for comparison. The bold drawings are really clear and it works very well. 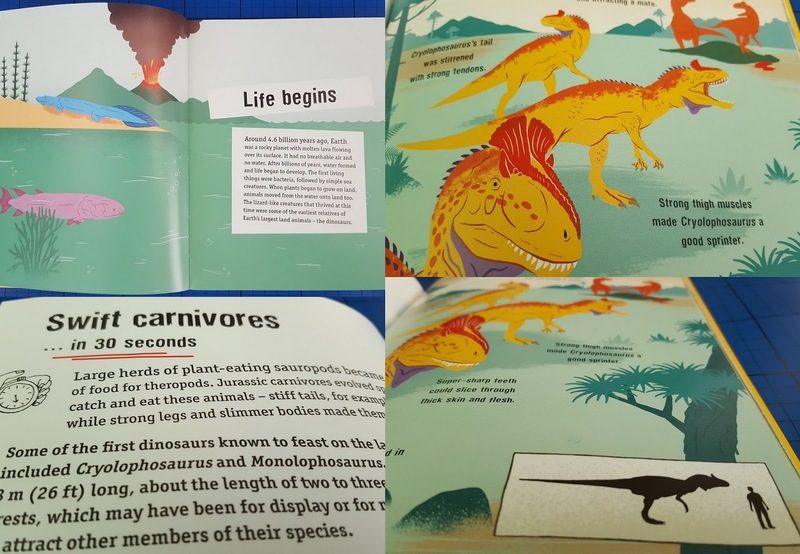 As the title suggests, the book is broken up into 30 second snippets of reading, and is bursting with interesting facts about dinosaurs and the history of the world as a whole. 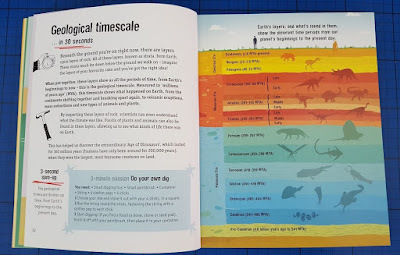 It's laid out so clearly, I can't fault it, and if you want to explain evolution to your child, then this book is perfect. We have previously talked about evolution, but when he was looking at this book my almost 8 year old's brain cogs went into overdrive, and he was full of excitement telling me how life evolved and moved from sea to land, and then why he has ginger hair. I saw the moment he truly 'got' evolution and the beginnings of genetics. This is real science! Both of my boys have spent a long time with Dinosaurs in 30 seconds. 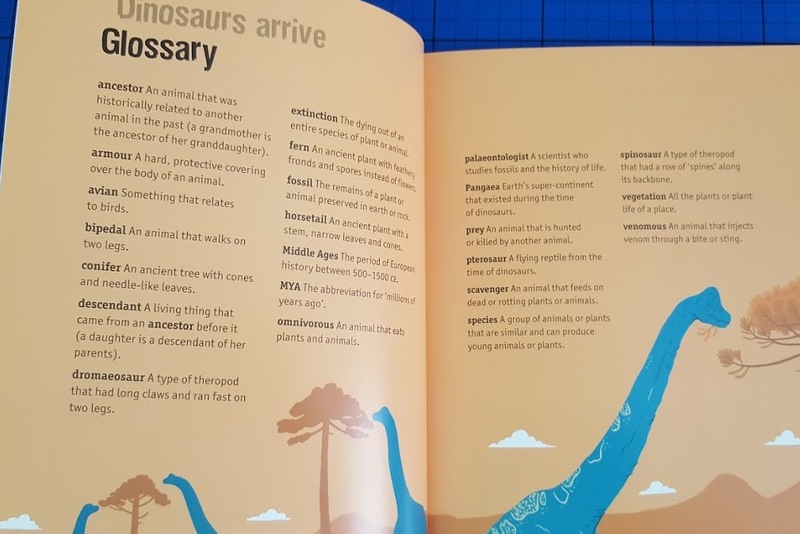 Some of the spellings are quite tricky for a 6 year old to read, but my 8 year old is more than happy to read aloud, and we've all been told all kinds of facts over the past couple of weeks. 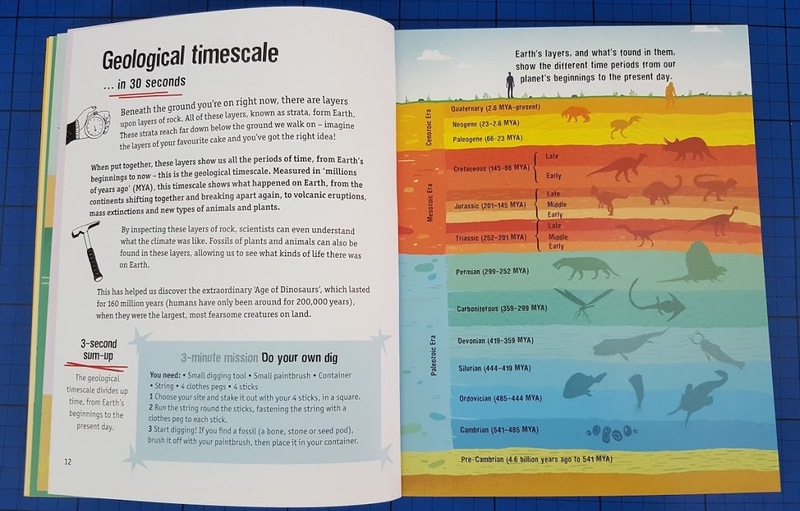 Some of the facts are quite basic, but plenty are much less well known or more complex, meaning any child of around 7+ (and their parents) can gain a lot from this book. It's worth the cover price for the clear and visual explanations of evolution alone. 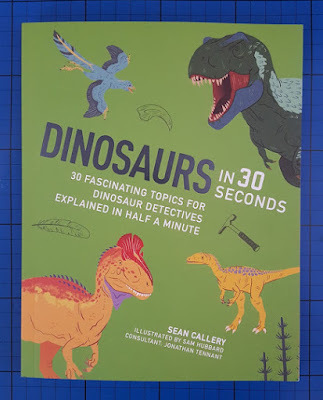 Dinosaurs In 30 Seconds: 30 Fascinating Topics For Dinosaur Detectives Explained In Half A Minute is written by Sean Callery and published by Ivy Kids (also known as QuartoKids). Available to pre-order now or instore and online from October 6th in soft cover edition with 96 colour pages rrp £7.99. We were sent our copy of Dinosaurs In 30 Seconds for review.